Building a Pool? Read this post first! Hi friends! Last year we jumped into the adventure of building a Concrete Gunite Pool in our backyard. 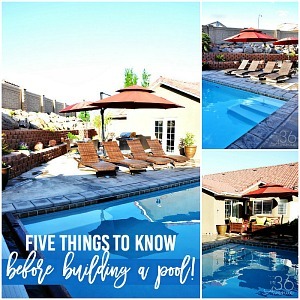 I wanted some time to pass before sharing a review and the ins and outs of building a pool. In the next few weeks I’m going to share design tips; pros and cons, costs, and much more. 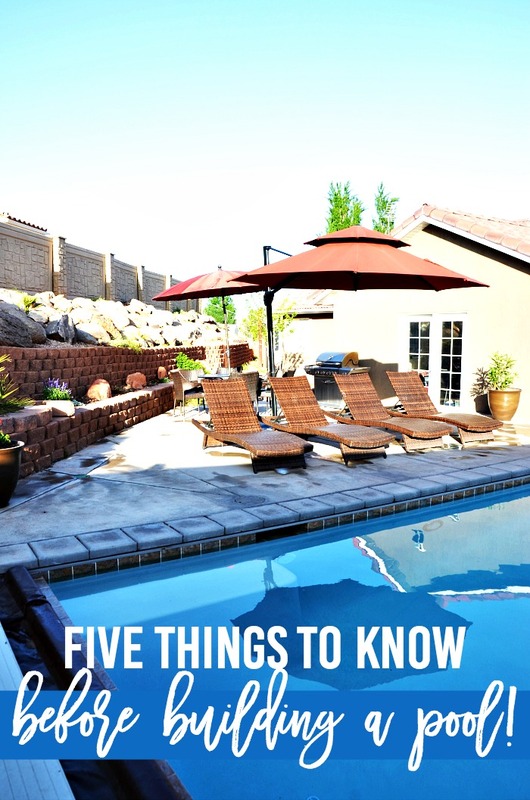 Today I’m going to focus on five things you should know before building a pool! Plan ahead! Keep in mind that it takes anywhere between 3 to 6 months to build a pool. Such things such as weather conditions, getting building permits, removing old landscaping, and even property damage can delay the building process. On top of that you should add a month to research your options and make design decisions. In our case we had our first meeting with our builder in January and our pool was not finished until the end of June! If you are planning to have a swimming party this Summer you better hurry! One of the compliments we get more often than any others when family and friends come over is how awesome the location of our pool is. I love that we have a full view of it from our kitchen window and that it is located right there in our backyard. The easy access makes my kiddos always want to use it and it gives me peace of mind that I can see them when I’m in the kitchen making a snack or fixing lunch. Make sure to ask your builder about city ordinances and safety regulations before you decide to invest in your own paradise! In our city for example in order to get a permit the pool area must be fully fenced. I know that some other neighboring cities also require for the pool to have an attached cover. We didn’t found out about these requirements until after we had already signed the building contract. Fencing your property and adding a cover will add extra costs! Fortunately for us our property was already fully fenced and we were planning on having a cover anyways. 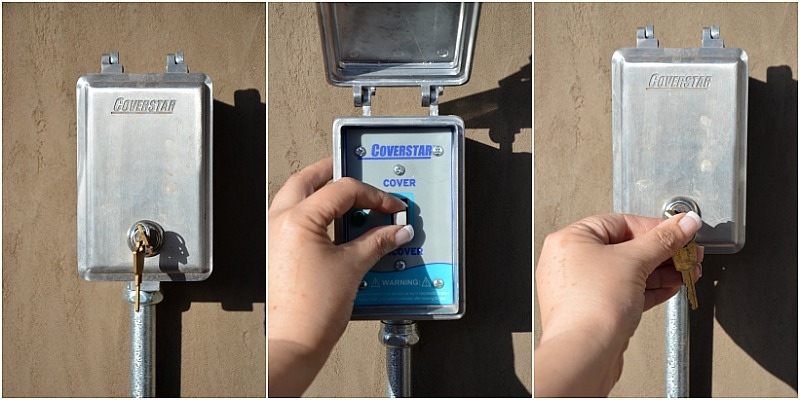 We installed an automatic cover and we love it for safety and maintenance reasons! We chose a brown cover instead of the traditional blue one because I wanted it to blend in with our outdoor furniture! I love that I can lock the box to the cover opener when I don’t want my kiddos to be in the pool area or when we are not in the house. Safety always comes first so make sure you talk to your pool builder about what are the best options for you and your family! 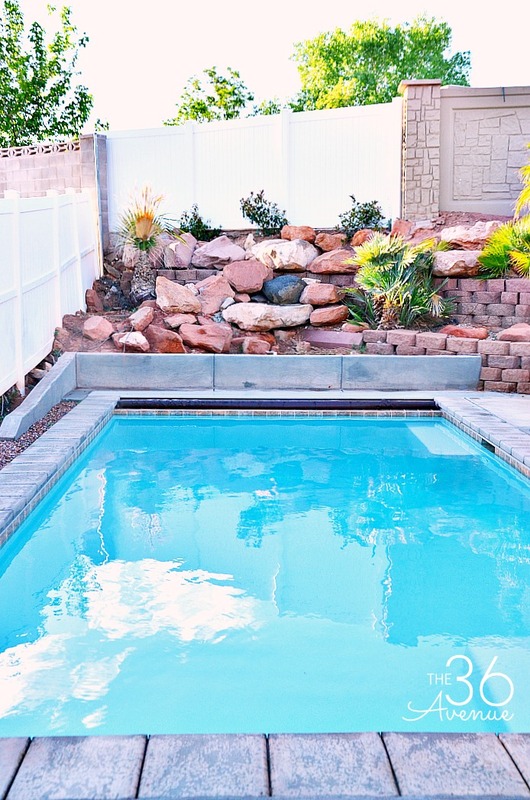 Before you choose the shape of your pool determine what you are going to use it for. I personally think that free form pools are prettier than the rectangular pools. So why did I choose a rectangular one? Well, you lose a bunch of square footage when you build a free form swimming pool. I have four kids and a bunch of their friends like to hang out at our home. With the limited space that we had, we wanted to build a swimming pool that could have a bunch of people inside and with plenty space to play. You also want to consider how deep you want your pool to be. Ours goes from three to six feet deep and it’s perfect for us! The most popular question I get is if it was worth the money? We live in a place where three to four months of the year are above 100ºF. The high temperatures make the pool 100% worth it for us! We normally didn’t stay outside often from June to the end of September because it was too hot for the kids. Now they are out there the entire Summer! Utilities will go up when you build a pool. Obviously you’ll need to use extra electricity to keep the motor and filters working and also you will use extra water to fill up the pool and keep the proper water levels. Another additional cost is the chemicals that you need to maintain the water clean and the cost of help if you decide to hire someone to clean it. 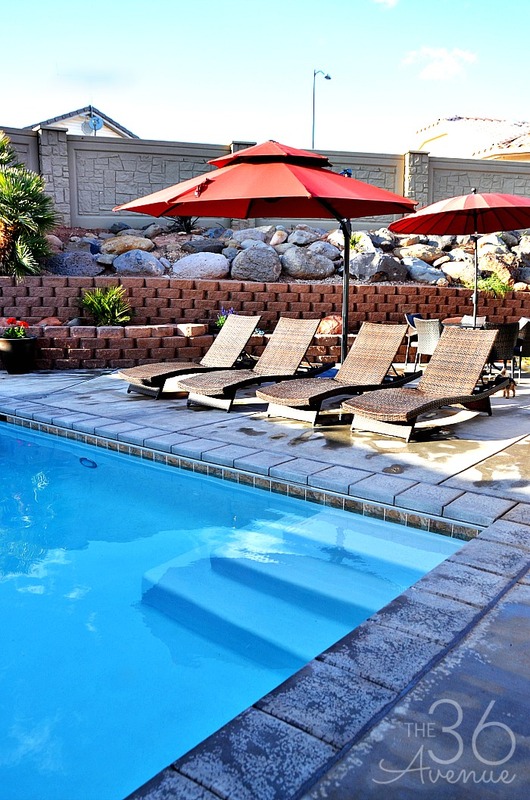 We personally take care of our own pool and it takes just 15 minutes a day during the late Spring and Summer season and 15 minutes a week during fall and winter months. Ask your pool builder to show you how to take care of your pool and if you want to save some money do it yourself! 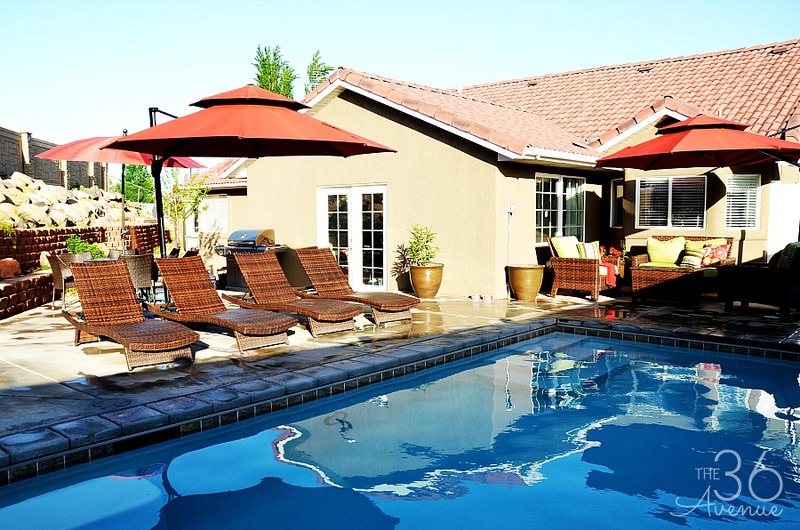 Don’t build a pool as a financial investment. Your house won’t appreciate to the amount of money you paid for the swimming pool. Look at it as a quality of life investment! When I think about the amount of hours my kids spend playing outside instead of electronics, the memories that we are making as a family, and the opportunity we have to share fun summers with family and friends, for us building a swimming pool was 100% worth it! I will be back next week to share some design tips! Here are some other DIY Outdoor Projects that we love! Your landscaping is really beautiful. I like your terraced spaces, especially the tall wall which seems like it gives great privacy. Very nice! 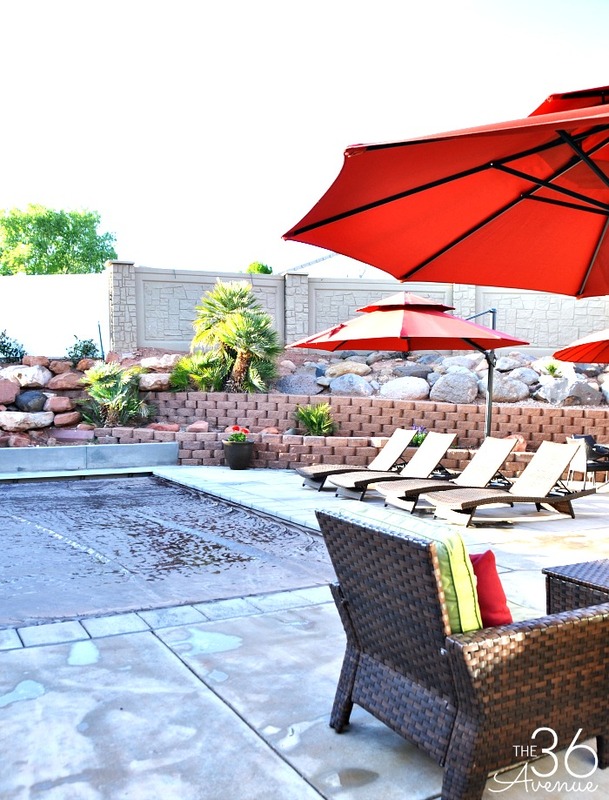 Thank you Lisa… That back wall is one of my favorite things about our backyard as well! It turned out GORGEOUS!!!!!!!!!!! When we lived in the heat- a pool was essential! !